ProComp Infiniti respiration sensor & cable (SA9311M) is approximately 52 inches (132 cm) in length and is terminated in a stretch belt that will fit around either the thoracic (chest) or abdominal (stomach) area. The respiration sensor is a sensitive girth sensor worn using an easy fitting high durability woven elastic band fixed with a length adjustable webbing belt. It detects chest or abdominal expansion/contraction and outputs the respiration waveform. This respiration cable is for use with Thought Technology ProComp Plus, ProComp Infiniti, ProComp 2, Procomp5, or Flexcomp series systems. A stretch sensitive device is strapped to the torso to measure the relative amount of expansion that occurs during respiration (breathing). As breathing in takes place the rib cage expands which stretches the device. When exhaling, the stretch relaxes and the sensor returns to its neutral position. The resulting waveform is displayed on the screen. To monitor thoracic respiration (chest breathing), the strap is positioned to the upper aspect of the trunk. Position it on the lower aspect of the trunk to measure diaphragmatic respiration (stomach breathing). For most applications, placing one sensor around the abdomen is required. Optionally, you can place a second respiration sensor around the chest. Using two sensors is helpful for abdominal breathing exercises. The three straps (respiration sensor strap, elastic strap, and belt strap) are buckled together, and then placed around the client's torso. 1) do I need to buy something else besides the device itself? 2) is there SDK or API to the device so that we can synchronize? The respiration sensor requires a Procomp 2 or Procomp 5. The Respiration sensor SA9311M is sensitive to stretch. When strapped around a chest or abdomen, it will convert the expansion and contraction of the rib cage or abdominal area, to a rise and fall of the signal. The respiration signal is a relative measure of chest or abdominal expansion. From the raw signal waveform, the Infiniti software is able to calculate the respiration rate and relative breath amplitude. 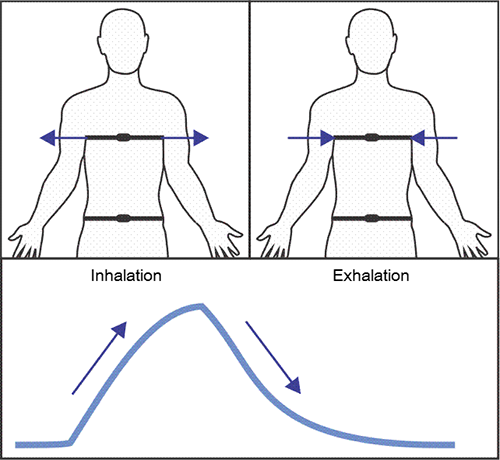 If two respiration sensor are used, it is possible to compute the difference in amplitude from expansion between the thorax and abdomen. NOTE: (The ProComp5 Infiniti does not generate standard units of measure for respiration). The sensor consists mainly of a long strap that is stretched around the client's chest or abdomen. The sensor should be placed during a full expiration and quickly fastened with just a small amount of tension at the time. The sensor should not be loose when breathing out completely. The sensor can be placed on top of clothing, if not too bulky. NOTE: The tube is made of natural rubber and some people may be allergic to rubber. Please verify allergic conditions before using the respiration sensor. When using two sensors, one is normally strapped around the chest, just above the breasts, and one at the level of the navel. Avoid storing the sensor with the tubing stretched as this will shorten its usable life. There are many breathing patters that can be recognized, but there is actually no typical waveform for the respiration signal. Commonly, there is a fast rise that slows near the top of the breath and this is followed by a fast fall that slows near the end of the breath. The breathing pattern will alter with the focus on a task, while talking or falling asleep.